LIFETIME WARRANTY. All saddlebag mounting hardware is aircraft grade aluminum. NO breakable plastic buckles. 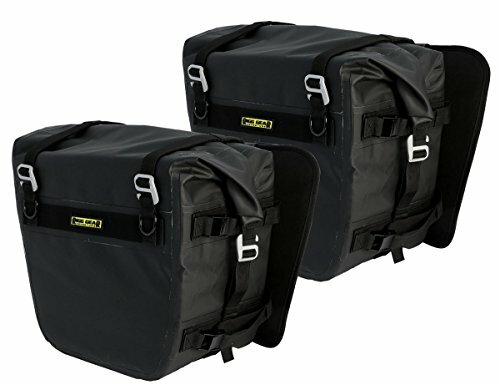 100% waterproof motorcycle saddlebags, All seams are electronically heat welded Includes 2 lightweight saddlebag liners to easily remove and pack contents. Removable stiffeners allow the saddlebags to hold their shape when empty. Firm internal back plate helps support saddlebags Replaceable pads helps protect saddlebags from rubbing on your motorcycle rack. Compression straps can also be used to mount optional Nelson-Rigg dry roll bags. Each saddlebags securely mounts to your motorcycle using 4 quick release cam buckles and double pull straps. Made from waterproof and durable 24oz tarpaulin PVC. UV Coated outer material cleans easily. Easily mounts to Motorcycles, PWC and snowmobiles. Available in Black (SE-3050-BLK), Yellow/Black (SE-3050-YEL). Main compartment measures: 15"L x 8"W x 14"H. Holds 27.53 Liters per side.